I know I’ve been saying for quite some time that I am going to publish a post with our favorite iPhone and iPad apps for the kiddos, but the problem is that I keep finding more to add to the list! For now I’ll share our latest favorite – discovered just today – and I promise to publish a “top list” soon! 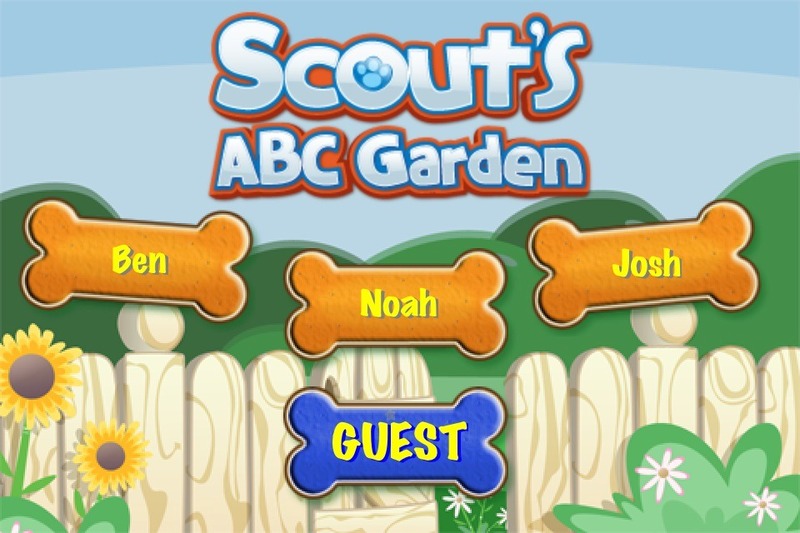 From LeapFrog comes Scout’s ABC Garden, available now in the Apple Store for just $3.99. 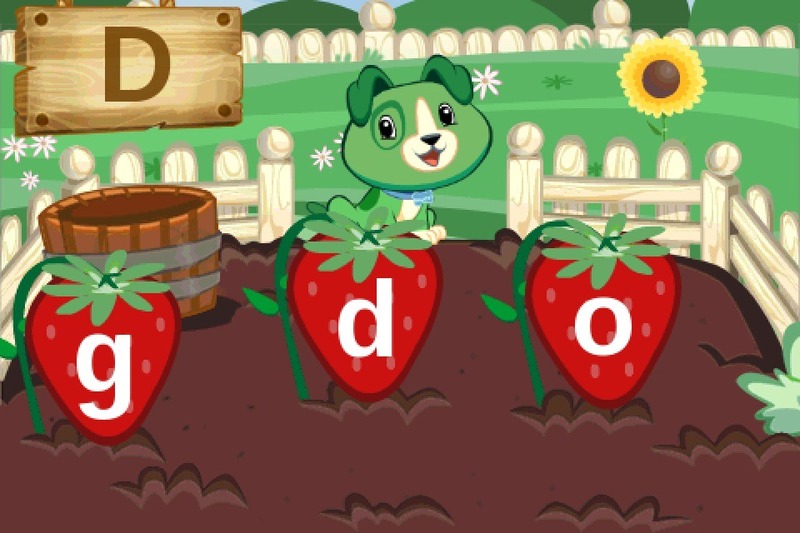 Our lovable puppy pals have gone digital in this first game of an upcoming LeapFrog series designed specifically for the iPad™, iPhone® and iPod touch®! With Scout’s ABC Garden, parents can personalize the learning by choosing either Scout or Violet and “teaching” them their child’s name and favorite things. 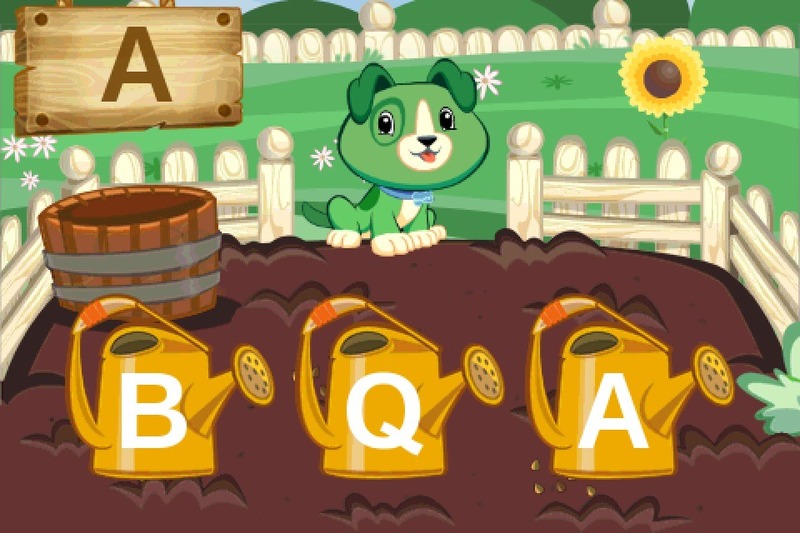 And as children follow their furry friend’s lead to alphabet fun, they can collect achievements for learning letters! We had the opportunity to preview Scout’s ABC Garden this afternoon. Josh, Ben and Noah were all able to set up profiles where they taught their newest furry friend their name, favorite colors, favorite colors and favorite foods. Being that all three of them wanted a turn to play the game, we have yet to discover how these fun facts will play a role in learning and playing throughout the game, but each of the boys are excited to find out. One of the things that I love about this app is that there are three different challenge levels, so all three of the boys can play at their own level. In levels one and two, Noah and Ben started out matching uppercase letters in the Letter Garden. In level three, however, Josh had to match uppercase letters with lowercase letters. Being that the app is geared for ages 2-4, Josh did become a bit bored after just a few minutes, but still enjoyed trying a new game for my sake. Ben and Noah, on the other hand, played for quite some time. They mostly enjoyed playing fetch with Scout, counting bubbles, and watching the colorful musical notes. It will be fun to see how the game develops past letter matching in the Letter Garden, but for now Ben and Noah are hooked! Five of you will be able to try the app free of charge, courtesy of LeapFrog! Just leave me a comment telling me about one of your kiddos’ favorite apps. On Sunday night I’ll choose five lucky readers’ comments and each will receive a gift code so they can download this app for their own preschooler on their iPad, iPod Touch or iPhone. Watch for more of our favorite apps and a big announcement… coming soon! I’d love to try Leapfrog’s new app! We’ve used their physical products since my 5 year old was just a baby. My kids really like Gina the Talking Giraffe! It doesn’t teach anything, but it’s a great reward for when my 3 year old uses the potty, or when I need to get things done around the house. My girls like super why and Angelina ballerina dress-up apps. My daughter’s favorite app is the Read Me Stories – Children’s Book. Very cool! My grandkids and I all LOVE Leap Frog products. We have most of their DVDs and just found out they have two new ones out, both of which are also available on Netflix – YAY 🙂 My younger grandkids would LOVE this app! My older grandkids love the Labyrinth apps along with Tic Tac Toe and, in honor of their Webkinz Stuffed Animals, we also have both of the Webkinz apps on this granny nanny’s cell phone. We have Violet and got Scout for my nephew. =) Fun! My girls really like Paper Toss and Zoodles. My daughter would love this. One of her favorite apps is Cookie Doodle. My daughters favorite app is angry birds!! My kids’ favorite apps are Lego Photo and Angry Birds. My five year old passed my Angry Birds level on the first day of trying! They love, love, love their Leapsters and Leappads and would be over the moon with a new LeapFrog app! Thanks for the fun contest!